Kia Motors, world’s 8th largest automakeris all set to launch the much-awaited mid-SUV in 2019 with an aim to be amongst the top 5 automakers in India within three years. With a target of launching a new car every six months after the launch of the first product in India, Kia is planning to expand its portfolio to at least 5 vehicles by 2021. Kia Motors made its debut in India at the Auto Expo 2018 and showcased its 16 top global line-up along with SP Concept, the most liked car at the Auto expo. The upcoming car is being manufactured in the company’s Anantapur plant will roll out in the second half of 2019 and will be equipped with world-class quality, finest design and state-of-art technology. Drawing inspiration from India and the ‘powerful’ face of India’s very own ‘Royal Bengal Tiger’, the car carries Kia’s famous and the most distinctive feature- ‘Tiger Nose Grille’, designed by Chief Design Officer, Mr. Peter Schreyer. The car truly fits into the ‘Make in India’ segment and combines everything Indian customers desire in a car promising state-of-the-art technology with a sporty, stylish design which is a Kia signature. On January 29, 2019, Kia Motors India marked the start of trial production of the upcoming mid-SUV in the presence of the Honorable Chief Minister of Andhra Pradesh Shri N. Chandrababu Naidu. 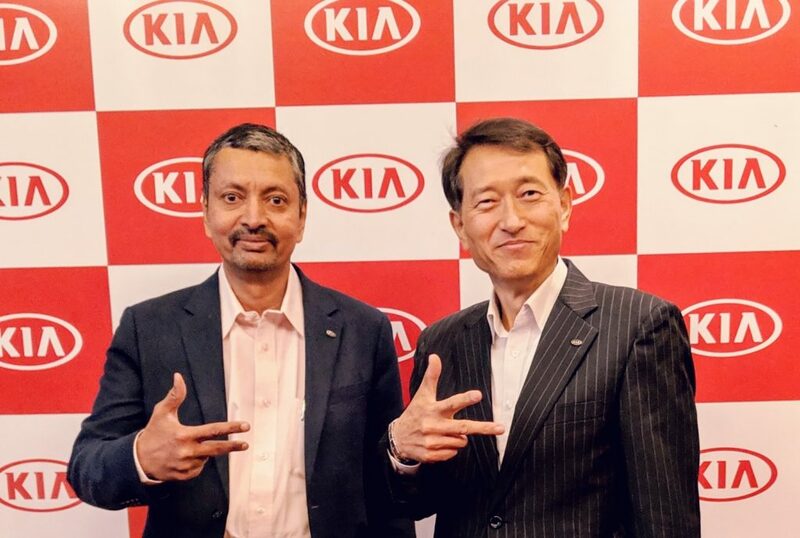 The ceremony was also attended by Mr. Han-Woo Park, President & CEO of Kia Motors Corporation, and Mr. Kookhyun Shim, Managing Director and CEO of Kia Motors India. During the ceremony, Kia also showcased the camouflaged production version of its first car for India a mid-SUV which was test driven by Shri N. Chandrababu Naidu along with Kia Motors leadership adding to the excitement of Kia arrival to India and reiterating the brand’s philosophy of “Power to Surprise”. The mid-SUV’s production home will be the enormous 536-acre Anantapur plant which has an annual installed capacity of producing over 300,000 vehicles and will create over 3,000 direct and 7,000 indirect jobs in the region.A US$2bn investment by Kia and its vendor partners ensures the availability of world-standard technologies and the development of high-quality local manufacturing skills. An integrated automotive production facility, the new Anantapur plant employs the latest production technologies, with more than 300 robots automating the press, body and paint shops. The plant is also capable of producing hybrid and electric vehicles. Kia takes immense pride in the fact that the plant has the most advanced global technology such as Robotics & Artificial Intelligence and is remarkably environment friendly with capabilities like 100% water recycling within the plant. In addition to this, the plant houses a five-acre training facility that offers a Basic Technical Course (BTC) in automobiles for skill development to provide all the skills necessary for an entry-level job on the factory floor, in the plant. The entry in Indian market will play a crucial role complementing company’s other plants in Korea, Slovakia, China, USA and Mexico. Entering the Indian market, Kia plans to expand its portfolio by launching a new car in every six months, lining at least 5 vehicles by 2021. Staying true to the company’s global commitment of ‘The Power to Surprise’,Kia plans to provide experiences that go beyond expectations. The brand is deeply focusing on future mobility, design, product and capacity along with world-class vehicle maintenance and repair services facilities to create strong foundations in the country by providing the best car ownership experience to Indian customers.Since its entry in the Indian market, Kia Motors has focused on developing a strong Aftersales & Network presence in India and customer relations. To further ease the process of owning a Kia, the automaker has signed an MoU with 8 leading banks of India to provide financing solutions with attractive offers to the customers that will enhance the brand’s penetration in tier 2, 3 and 4 markets. Kia Motors India recently concluded its second phase of roadshows, covering26 cities over a span of two months covering 15,000 kms. Through this activity Kia Motors India reached out to over 10,000 potential customers and buyers across the country. Globally, Kia Motors Corporation has more than doubled its sales since 2008, reporting sale of 2.8 million cars last year Aligning with the global vision of Kia Motors Corporation to launch 16 electric vehicles by 2025 and make the planet greener and cleaner for the generations to come, Kia Motors India is committed and confident of producing hybrid and electric vehicles at Anantapur plant. Recently the company signed a Memorandum of Understanding (MoU) with the state of Andhra Pradesh to collaborate on the ‘Partnership for Future Eco Mobility’ by giving 3 Nirocars – Hybrid, Plug-in Hybrid and EV – to Andhra Pradesh government. Kia vehicles are the highest quality products in the world today. Kia has surpassed all other global automobile brands sold in the USA to achieve the top ranking for four consecutive years in JD Power’s Initial Quality Study. To maintain this quality, the company is focusing on training &upskill indigenous talent in India to create highest level of localization in the products without compromising on global quality. Design has been at the forefront of Kia’s brand philosophy and the company has proved its design prowess time and again. This year, Kia won three prestigious Red-Dot Design award for the Kia Ceed range – marking the third consecutive win and cementing Kia’s position as car design leaders in the world. Additionally, Kia’s first brand TVC for India revealed the 9 different elements that are instrumental in lending the inimitable design exclusive to Kia cars in a very creative manner. The brand campaign TVC has already gained 200 million views in a record time and was referred by both experts and enthusiasts as an Ad you just can’t ignore.